Communities in Sydney and Melbourne will benefit most. ALMOST €415,000 WILL be granted to organisations in Australia this year to provide welfare servcies and support to Irish emigrants. Minister for the Diaspora Jimmy Deenihan announced the news in Perth. He is currently on a ten-day trade mission to the country. The funding, which is being granted to 16 organisations that provide services to some of the 70,000 Irish-born people in Australia, is part of the Foreign Affairs and Trade’s Emigrant Support Programme. In 2014, grants of €12.5 million will be provided to support the Irish community around the world. Deenihan said that the money will “support frontline welfare organisations to help members of the Irish community, particularly those who are elderly or vulnerable”. Funding has also been made available to organisations that help foster Irish culture and heritage. 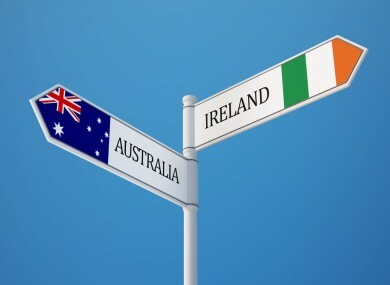 “Australia is often dubbed ‘the most Irish country in the world outside of Ireland’ and the stories of successive Irish emigrants and their descendents form an important part of Australian history,” Deenihan said. He noted that in the country’s 2011 census, nearly 2.1 million Australians indicated they had Irish ancestry. The largest single recipients in Australia are the Irish Australia Welfare Bureau and Resource Centre, Sydney (€119,492); the Irish Australian Support and Resource Bureau, Melbourne (€99,656) and the Irish Australian Support Association of Queensland (€58,946). The funding represents a €70,000 increase on grants given in 2012 and a €14,000 rise on last year. While in Perth, Deenihan also officially opened the new Honorary Consulate for Western Australia. New Consul Marty Kavanagh and his team will provide consular assistance to Irish citizens in region, as well as information to Western Australians about Ireland. Email “Here's how much we're spending to support Irish emigrants in Australia”. Feedback on “Here's how much we're spending to support Irish emigrants in Australia”.